The 17th annual BOBCATSSS symposium was held in Porto, Portugal from 28-30 January 2009. Besides hosting the conference in a city rich in beauty and history, the symposium itself stands apart as particularly contemporary and wholly unique symposium organized by library and information science students for library and information students. BOBCATSSS, under the auspices of EUCLID (European Association for Library and Information Education and Research), was created and held to increase communication and collaboration between students from Eastern and Western European universities. This year’s symposium had over 300 participants representing 40 different countries on five different continents. The theme of this year’s BOBCATSSS was “Challenges for the New Information Professional”, an appropriate theme considering the continuously shifting and changing nature of library information science field. The subthemes were organized around the interdisciplinarity of information science, the information professional and information management, the impact of new technologies on the life of the information professional, the rise and fall of physical libraries and archives, information literacy, eLibraries & eArchives, and Librarian 2.0. The symposium offerings were plentiful and diverse including paper presentations, company presentations, workshops, panels, and poster presentations. The overall offerings are broader than what could be explored in the rest of the report. For obvious reasons the majority of presentations dealt with issues relating specifically to the challenges of being a new information professional in an increasingly global world. It became apparent that to survive in the fast-paced global environment, library and information science professionals must be responsive, flexible, learn new technologies, create and develop partnerships, develop leadership and entrepreneurial skills all while mastering or maintaining many of the skills or abilities needed in the traditional physical library. Is that it? Is that it? We wouldn't bet our shirt off the back but it appears that BOBCATSSS-attendee and LIS-Traveller Sebastian Wilke catched a nice perspective down Porto's R. de São João Novo towards the river Douro. 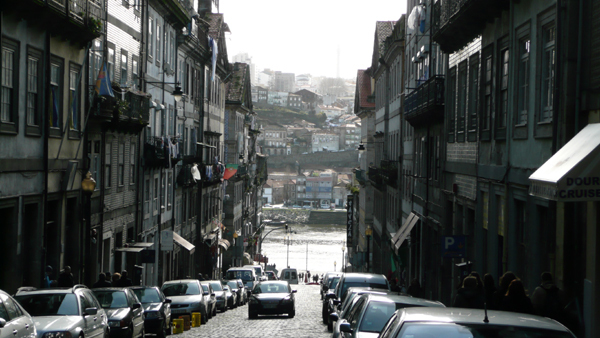 If you walk down this street in the Ribeira-neighborhood and turn to the left there is the Rua dos Canastreiros right beside. And once there you may snack in the rather famous restaurant Chez Lapin for some Bacalhau à Brás, probably taken with a fine Rabigato. You've time to watch out for some Rabelos passing by afterwards. While the challenges that lay in front of future information professionals sometimes seem daunting, the panel session on education and training in LIS gave a little hope. A recent Portuguese graduate eloquently spoke about how she and fellow LIS students are gaining skills in our education that prepare us with a valuable skill set that can work in many spheres of both the private and public sector in roles where other employees cannot succeed, especially in IT areas where understanding user needs is vital. The global nature of library and information science was also addressed in this session as Anne Maria Tammaro, chair of the Education and Training Section with IFLA, expressed the Education and Training Section’s desire to have more student involvement. While many of the new challenges to information professionals take place outside the physical walls of the traditional library, there are also many challenges within the walls. The physical library is still an integral part of the library. In their presentation entitled “The fall and rise of the physical library”, Henrik Jochumsen and Caspar Hvenegaard Rasmussen, from the Royal School of Library and Information Science in København, discussed how the physical library is alive and well. Speaking of walls there were also a number of presentations that looked at how barriers to library and information services could be diminished by understanding users’ environmental needs, whether by fostering a multicultural environment or understanding the context in which historians work best. Sebastian Wilke and Jessica Euler presented a paper entitled “Diversity management as a key challenge to the library in the multicultural society,” which was the byproduct of a project where a class created a student anthology around the provision of services to a multicultural patron base. They discussed promoting multifaceted activities and services that allow for an appreciation of different cultural heritages and encourage the use of a library as a social meeting space. The idea of creating a student anthology around a specific topic is a great idea for a library and information science program. Abdelhamid Boujdad Mkadem, in his “Digitizing old manuscripts in Morocco: A historical research issue,” presentation, analyzed the information needs of historians using old manuscripts in Morocco, in order to determine if digitization of said manuscripts would benefit the information needs of historians. This was an interesting study because it shows that even though items can be digitized it is not always what the users want or that they will use, so in general when thinking about a digitization project it is important to know your audience. The findings were, although historians appreciate the importance of digitization, they prefer to study the manuscripts directly. The main reason for this is they appreciate the added knowledge and context that the owners of manuscripts add to the historians’ study of the manuscripts. At any conference, symposium, or gathering of two or more library and information science professionals there are bound to be conversations, connections, and collaborations. For example, at this event the author met a library student during the very first coffee break of the symposium who was trying to set up an internship with a library in the author’s city. They were able to exchange contact information and now the student will have at least one contact when he is doing his internship. It is important to have communication, conversation and collaboration between future information professionals. Based on the experiences of this year’s symposium in Porto this is happening and BOBCATSSS is an integral part to communication between library and information science students. At the beginning of BOBCATSSS 2009 Tom Wilson opened his talk with the following statement: “The past is a foreign country – and so is the future.” While the both the past and future are foreign countries there are still steps we can take as information professionals to make the exploration of those foreign countries a little less daunting. For those who attended BOBCATSSS 2009, there is one foreign country in the past that is not so foreign anymore. As for the future, those who plan to attend BOBCATSSS 2010 will definitely have a foreign country in their future, one future information professionals should explore.